Malcolm Prentice has almost 40 years of experience as a mason and bricklayer, with a huge variety of creative projects in his portfolio. Everything from 40-foot rock chimney show pieces to rock-faced hot tubs and cozy brick living room fireplaces – Mal has done it all. He also creates authentic Italian pizza ovens and the outdoor kitchens to go with them; and does masonry and brick chimney repairs. Mal’s work can be found all over the Upper Sunshine Coast, Powell River, Desolation Sound, Hardy Island, Nelson Island, Lund, Bliss Landing and beyond. 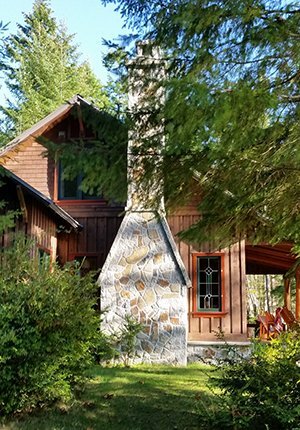 For example, the granite chimney (right) that Mal built on Hardy Island was featured on the cover of Cottage Magazine a few years ago. Do you have an unusual or complicated masonry project?